I am sitting in my suburban New York apartment awaiting a predicted blizzard, which means reacquainting myself with my essential inanimate pals, Ms. Down Parka and Mr. Snow Shovel. The thought fills me with dread and gloom. But there are always palliatives, and what I offer you requires no prescription, no copay, no trip to the pharmacy. And it works just as well if the sun is blazing in through your windows. Hot jazz — performed and recorded in this century — is the organic remedy offered here. The thermodynamic healing practitioners are known both as the First Thursday Band and the Yeti Chasers: Ray Skjelbred, piano, vocal, leader; Steve Wright, cornet, clarinet, alto and soprano saxophones, vocal; Dave Brown, string bass, vocal; Mike Daugherty, drums, vocal. They created these sounds at the Royal Room in Seattle, Washington. Another romp built on the threat of impending doom (thanks to Henry “Red” Allen for this and so many other inspirations), YOU’RE GONNA LOSE YOUR GAL. Watch out for that cymbal (Mike’s performance-art piece in tribute to Zutty Singleton, 1928)! I don’t think this band needs a serious explication of its virtues, individual and collective. Don’t they sound fine? I feel better, and hope you do, too. came to Sydney on the Matson Line ships). The first ‘jazz’ version was recorded by Turk Murphy for a Columbia LP on 19 Jan. 1953. The notes by George Avakian to that ‘Barrelhouse Jazz’ LP says that Turk came to it from the Castle Jazz Band (who recorded it later in Aug 1957) via Don Kinch and Bob Short, ex Castle band members). published by Robbins Music Corp.
Longing for someone in sympathy. Then you wish you had your old gal back again. At the four bare walls. And the gang’s gone home. When the future doesn’t look so bright. Then you long to hear a knock upon your door. More from the First Thursday Band — a small hot jazz ensemble that appears on a particular day at the New Orleans Restaurant in Seattle, Washington. They are Steve Wright on reeds and cornet; Ray Skjelbred, piano; Dave Brown, string bass; Mike Daugherty, drums. Each member of the band occasionally takes a casual but expert vocal, and these four players swing as soloists — and, even better, as an ensemble. Here are a few selections from their their Thursday date of 2.2.12 — a harmonious-looking date in itself. To me, this compact little band is a triumph of both sound and intuition. The players hark back to a time when you could tell an instrumentalist or singer in a few notes — instantly recognizable personal identities, like the great film stars. No one ever confused Bette Davis or Benny Morton with anyone else! Each member of this quartet has his own identity, and although the whole concept honors the past (so you could, if you liked, talk about Charlie Holmes and Jess Stacy, George Wettling and Al Morgan among a hundred other heroic figures), you hear Skjelbred’s traceries, Brown’s resonant pulse, Daughterty’s cornucopia of rocking sounds, Wright’s lyrical messages. And the quartet is more than simply four great players bundled together onstage: they remind me of the great string quartets who worked together for years and played better than four individuals with bigger names. Intuition is at work here — so that each player is both advancing his own vision and listening deeply to what the other fellow just “said,” or anticipating what he thinks is coming next. A little family of people who know the same language and love its possibilities. I don’t know when I will end up in Seattle, but I would like it to be a First Thursday. These videos — and more! — are posted on YouTube by the very gifted Mr. Wright — you might want to subscribe to his channel, swr2408018 — so you don’t miss even a four-bar break. Imagine a jam session after hours in Chicago, circa 1934 or so (the date, being imagined, is flexible). Waiting their turn to play are Pee Wee Russell, Rod Cless, Omer Simeon, Boyce Brown, Guy Kelly, Jess Stacy, Earl Hines, Cassino Simpson, Frank Melrose, Joe Sullivan, Wellman Braud, Truck Parham, Zutty Singleton, George Wettling, and others. No, the late John Steiner didn’t record such a gathering of saints and heroes. But a modern evocation of such a gathering is to be found when one of my new-irreplaceable-favorite jazz groups, the FIRST THURSDAY JAZZ BAND, comes to play. 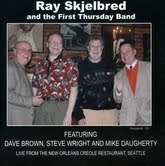 They are Ray Skjelbred, leader, piano; Steve Wright, reeds, cornet; Dave Brown, string bass, Mike Daugherty, drums. Everyone in the quartet has been known to sing a chorus or two. It’s a thrifty, focused, engaging quartet — listeners get more than their money’s worth! I’ve shared some YouTube videos of the band, performing at the New Orleans Creole Restaurant in Seattle, Washington — and more are at the bottom of this blogpost. But there’s good news tonight, as a famous radio broadcaster used to say. The First Thursday Jazz Band has just come out with their debut CD — drop evertyhing and pay attention, please! It’s an old-fashioned production: recorded on the job (but with a sweetly attentive audience) in good sound, with a variety of songs and approaches — one of those CDs you can listen to the whole way through and come back to again right away. If you know anything about Ray Skjelbred, you know that he rocks — and he loves both classic and unusual material. And people who admire him can argue (in the nicest of ways) if he is a greater soloist than an accompanist. Like Stacy, Ray is so fine backing up someone else that occasionally I want to listen to the track again just to hear his bubbling down-home fills and figures. Ray’s partner in the rhythm section is the quietly propulsive Dave Brown. String bassists tend to get less respect than they deserve, but rhythm is Dave’s business. And business sure is swell. He has a big plush sound (no amps, thank you kindly) but he doesn’t need one. And his time is neither stodgy nor over-eager: I think of the Blessed Walter Page when I hear Dave play. Mike Daugherty (the man with the red drum) is a jovial player with fine time and a whole galaxy of sonic effects from his kit. He doesn’t opt for the usual tricks, but often just stays on his snare with a rich, padding brush carpet, or moves around his set in a way that feels just right. No showboating, no look-at-me, not ever. Steve Wright should get triple or quadruple pay, but I don’t think he’d even entertain the notion of asking for it. A sweet alto player (a style I miss a great deal) with deep but casual lyricism, a clarinet player who can be Russell-tart or Darnell Howard-smooth, and a neat, unflurried Bixian trumpeter — sweetly to the point. That’s the band — and these fellows are having a good time purling through the repertoire. Their quiet pleasure comes through from the first note. The songs are YELLOW DOG BLUES / YEARNING AND BLUE / CAVERNISM / SOLID ROCK / TRY GETTING A GOOD NIGHT’S SLEEP / DON’T BLAME ME / LOVER COME BACK TO ME / FAR AWAY BLUES / NEVER HAD A REASON TO BELIEVE IN YOU / SHE’S FUNNY THAT WAY / LET ME CALL YOU SWEETHEART / HUSTLIN’ AND BUSTLIN’ FOR BABY / JAMES ALLEY BLUES / CHERRY / PENNIES FROM HEAVEN / SHAKE THAT JELLY ROLL. I wish I could send you to your local record shop and be assured that it would be there — several copies! — but I think those days are gone, gone, gone. However. Obviously if you meet Ray at a gig (or the other FT chaps) you can buy a copy for the pittance of $15. But for most of us, the idea of meeting Ray or the FTJB in person has a certain dreamlike quality. So for $18, Ray himself will mail you a copy. He promises! The details go like this. Ray Skjelbred can be found at 19526 40th PL. NE., Lake Forest Park, Washington 98155. If you need more information or want to make a quantity order of a hundred copies, feel free to let me know and I will tell Ray immediately. Here’s what the cover looks like. Now. I promised some new YouTube clips (I regret that they aren’t mine, but they are still lovely) recorded at the New Orleans Creole Restaurant on June 2, 2011. Want to be some place where they huggy and kissy nice? How about NAGASAKI? And that eternal plaint, WHAT’S THE REASON (I’M NOT PLEASIN’ YOU)? But that last song title (with apologies to Mr. Berlin) isn’t accurate. There are more videos from this evening on YouTube, and — that new CD! Be the first one in your neighborhood to be walking around with a wide grin — and when someone says, “Why the hell are YOU so happy?” you can say, “Have you heard the new CD by The First Thursday Jazz Band?” And — if you’re a really charitable spreader-of-the-good-word, you can share your headphones / iPod, or even invite them into your car for a few minutes of The Real Thing. Posted in "Thanks A Million", Generosities, Jazz Titans, Pay Attention!, Swing You Cats!, The Heroes Among Us, The Real Thing, The Things We Love, Wow!